This sweet potato flatbread only takes three ingredients! 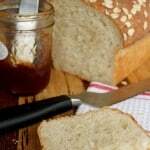 It does not require yeast or kneading and it is incredibly easy to make. It stays soft, tender and flexible making it perfect for sandwich wraps and if you roll it very thin, it can be used as a tortilla. Did you know that sweet potatoes can have orange, yellow or purple flesh? In America what we usually refer to as an orange yam is actually a sweet potato. A true yam grows in tropical climates, they have a rough, sometimes hairy skin that is difficult to peel and they are rarely seen in America. Those tropical yams are actually poisonous if eaten raw but are safe when cooked. We have never met the purple sweet potato but love both the orange and yellow varieties. The deeper the orange color, the more beta-carotene. The flesh of the orange sweet potato has more beta-carotene than carrots. This sweet potato flatbread only takes three ingredients! That’s it!! What kind of magic is that?! You might be skeptical that you don’t need more ingredients to make a fabulous flatbread but trust me, this is all you need. How Do They Stay Soft? The secret to success is all in the technique. After you cook the flatbread, stack them on top of each other and cover them with a kitchen towel. That will trap in the heat and “steam” them as they cool down. This is the critical step to keeping the flatbread soft and flexible. Don’t skip this step. Why Should You Make This Flatbread? Plus, there is so much nutrition and vitamins in sweet potatoes that combining it into a flatbread adds a healthy punch. This is pure genius! What Can You Use This Sweet Potato Flatbread For? Since it is so soft, they are perfect for sandwich wraps. 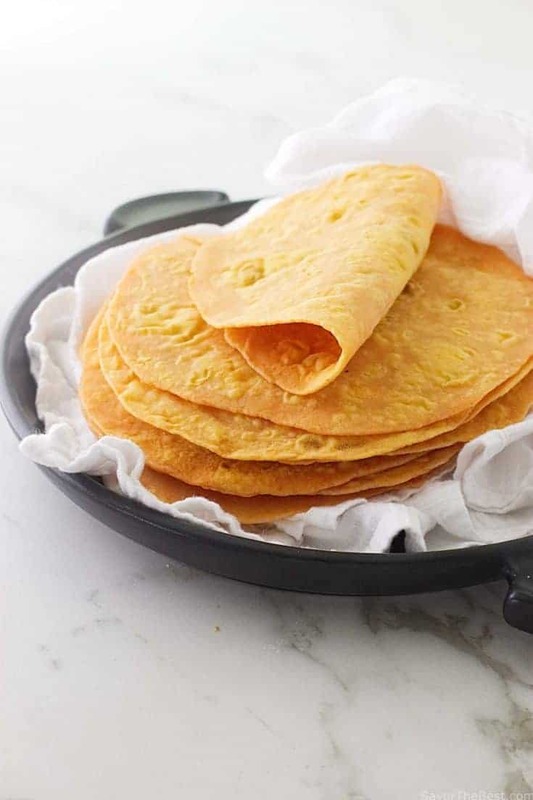 If you roll them very thin, you can use them as a tortilla. 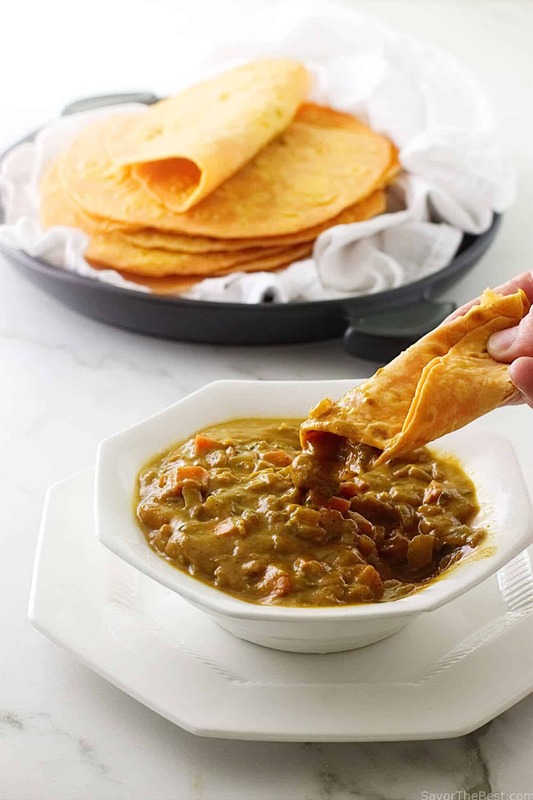 You can serve them with stews and curry to use them as a dipping bread. Get adventurous and cut them up and fry them in oil to make sweet potato tortilla chips. Slather them with Pizza sauce and top them with cheese to make a quick pizza. The uses for this flatbread are endless but honestly, it is so good you can enjoy it plain… no butter required. They are loaded with flavor! Watch our video below to see just how easy it is to make this sweet potato flatbread. They are wonderful served with a Hummus Dip, used for sandwich wraps, taco shells, breakfast burritos or just eaten plain. Try them with these Lamb Kofta Kabob Sandwiches or make a wrap using this Chipotle Pulled Pork. Sweet potatoes are fat-free and if you cook the flatbread on a non-stick skillet, you can make these with virtually no added fat. We used this 16 inch nonstick electric skillet and cooked two at a time to make quick work of finishing them. However, you don’t have to cook them all at once. The dough keeps well for 4 to 5 days in the fridge. Just seal it in an airtight bag so it doesn’t dry out and then you can make fresh sweet potato flatbreads throughout the week. What Kind of Flour Can You Use? and most brands of gluten-free flour. We have made them with great success using our Ancient Grains Gluten Free Flour Blend as well as this Cup for Cup blend and this Gluten Free Artisan Blend. If you use gluten-free flour, it will make them more delicate and difficult to work with and the dough will tear easily as you transfer it to the skillet. To solve that problem we slid one of these flexible cutting mats under the flatbread and transferred them directly to the skillet completely intact. This technique works great with other flours that are lower in gluten as well, like spelt, einkorn, and whole wheat. We made this flatbread by combining flour, salt, and hot mashed sweet potatoes. There is enough moisture in the sweet potato that additional water is not needed. The three ingredients are stirred together and divided into a log and cut into equal sections. 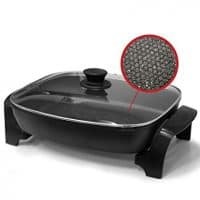 Each section is shaped into a small ball and rolled thinly, then cooked in a dry skillet for a minute, flipped and cooked another minute and BOOM! It is done! Watch the video below to see how easy it is to make. Check out our video to see how easy it is to make this sweet potato flatbread. Blend the flour and salt together in a bowl then stir in the mashed sweet potato until the flour is completely absorbed. If the mixture seems wet and sticky then add a couple tablespoons of flour (some sweet potatoes have more moisture and will require a bit more flour). Allow the dough to rest for 5 to 10 minutes. Dust the counter top with flour and shape the dough into a log then divide the dough into 8 to 10 portions and roll them into small balls. Coat the dough balls well with flour and roll them out until they are about 1/8 of an inch thick (roughly the thickness of 2 quarters stacked on each other). If you want to make tortillas then roll them out a bit thinner. Heat a non-stick pan on medium to medium low heat and cook for 1 to 2 minutes on each side. I like to flip them every 30 seconds to ensure they don't get too brown, if they are browning too fast I turn the skillet down a tad. If the dough puffs up as it cooks, just push the air bubbles out with a spatula. Once each flatbread is cooked, stack them on top of each other and keep them covered with a dish towel. This is the secret to making sure the bread stays soft. The towel will hold in the steam as they cool down, keeping them soft. The moisture content in sweet potatoes will vary greatly between the different varieties, cooking methods and age of the sweet potatoes. You may need to add extra flour if your sweet potatoes are very moist. Just add enough flour until it feels like a soft, workable dough. You will need a little over a pound of uncooked sweet potatoes for this recipe. Once they are cooked the skin slides off quite easily. The fastest and easiest way to cook your sweet potato is to microwave them. Simply pierce the sweet potatoes 4 or 5 times with a sharp knife, place them on a microwavable plate and microwave them for 10 to 14 minutes (depending on the size of the potato) until they are soft. When they are cool enough to handle but still warm, the skin practically slips right off.... so easy! You can either mash the sweet potato with a fork or give it a quick blitz in a food processor if you want a very smooth mash. This recipe works great with whole wheat flour and most brands of gluten free flour but will be more delicate to work with. Gluten free flour is especially more difficult to work with and the dough tends to tear easily as you transfer it to the skillet. These flatbreads store well in the fridge for 4 days or in the freezer for 6 months. Hi Darlene, the video is toward the top of the page, about 2 paragraphs down. If you scroll past it then it will pop over to the bottom right of your computer screen in a smaller square so you can watch it as you scroll down the page. If you’re on a mobile device then the video is toward the bottom of the page, just above the recipe card. Sorry for the confusion but it shows up differently depending on which device you are using. 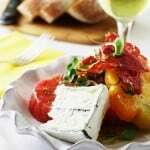 Can I use sweet potato flour instead of cooked sweet potato?. I’m looking to have premixes available in my freezer. Hi Kristy, not for this recipe. The sweet potato is what binds the flour. If you use sweet potato flour then you will not have anything to bind with the flour. You can make these flatbreads ahead of time and freeze them though. Yes Sheree, this will work with wholemeal spelt flour. That flour will absorb more moisture than regular all-purpose flour so you may have to adjust the amount of flour a bit. It doesn’t make a difference if the sweet potato mash is hot or cold. Some people swear it needs to be hot but I have made it both ways with perfect results. You will really love this with whole wheat spelt! Shes just replied she just might eat this now as she loves it a lot . shes the health nut in the family…Her mother was a health nut too…studied nutrition. I will cook the potatoes longer and cream them before adding to part flour and part oats grounded but still fry it in a butter as the brain still needs some fat and it does help the flow on out. By the way we had what I made with creamed avacado spread on and cucumber on top…I am grabbing cranberry next time what colors they make…. Nora you sound like you had a blast with this recipe. I would love to see what you get if you try beets with the recipe. Thanks for the comment, it was fun to read what you did. Hello from Germany. Thanks for the great recipe. I love it. One question about freezing them….do I thaw them afterwards and preheat them in a skillet? Hi Alice, once they are thawed they can be heated in a skillet or microwave, or simply eaten cold. Just be sure not to overheat them or they will get tough. I used gluten free flour and rolled them out in a cloth and cloth-covered rolling pin. No problem getting them onto the pan. Just wonder how you get yours a perfect roundness, though. Thanks for this recipe as I try to do gluten-free and egg-free most days. How would almond flour do with this recipe? THanks in advance!! I just made these flat breads for breakfast. They were easy to make and tasted great. I used whole wheat flour and added a handful of chopped fresh coriander leaves to the dough. I stacked the cooked flat breads in an insulated casserole and they remained soft and warm. We ate them with mango chutney. Hi, can’t wait to try these, has anyone tried Gram flour (chickpea)? Hey there Di, according to some other readers, chickpea flour will be a big fail on this recipe. I have not tried it myself but have received some feedback from other readers. I made these this past weekend and they are AMAZING. I rolled them a bit thinner to make more of a tortilla with them, and my whole family loves them. My oldest has strict dietary restrictions he has to adhere by and these fall into what he can have and he loves them! Thanks so much for sharing. This is such an easy recipe and the less ingredients the better. Thanks again!!! Is it possible to use quinoa flour instead and if so what quantity? Antoinette, I have not tried this recipe with quinoa flour so I can not be sure how it would turn out. It is a pretty versatile flour and might work well but it would have a pretty assertive flavor. I don’t know if the flatbread would stay soft after it is cooked and I don’t know how much you would need to use. If you do try it I would recommend starting with 2 cups of flour and after that is mixed in well then gradually add more until you get a workable consistency. What is the curry/stew pictured at the top that the flat bread is being dipped into? It looked so yummy! 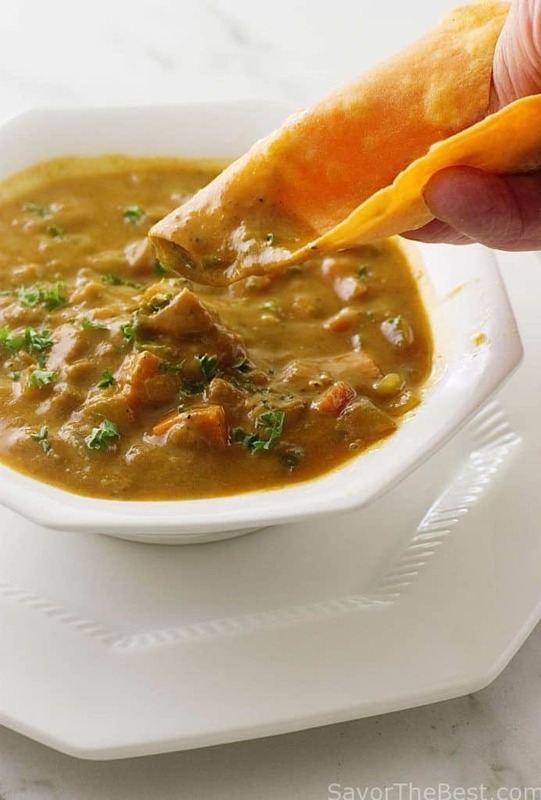 Hi Carrie, that was a super fast and easy vegetable curry that I threw together for the photo shoot. I sautéed an onion with some garlic then threw in some diced carrots (probably 3) and a diced sweet potato. Once that cooked for a couple minutes I tossed in 2 or 3 tablespoons of curry powder, a teaspoon of ginger powder, 3 tablespoons of tomato paste and a can of diced tomatoes. Then I threw in a cup or two of broth and a cup of canned coconut milk. It didn’t have all the complex flavors and veggies that a regular curry stew would have but it was actually pretty tasty and we ended up eating it all after I took the photos. Made with your ancient grains gf flour. You were right, they were delicate until I got them in the pan.Had to add extra flour and then Lots of extra when rolling. Dh and kids really like them so I’m happy. Thank you! Joy, thank you so much for the feedback. I really appreciate you taking the time and so glad Dh and the kids liked them. Oops another question, what about whole wheat or other whole grain flour. Would it still be the 2 cups? How would you store them? Can they be frozen for future use? Going to try these tonight!!! Good evening, savorthebest.com! I attempted making your Sweet Potato Flatbread recipe. I am NOT able to ingest the regular wheat, all-purpose, GF or any of the other starch flours. What I did use in the recipe was equal ratio of Sweet Potato to Bob’s Red Mill Super Fine Almond Flour, then used a 1/3 Cup scoop & a Tupperware Hamburger Press to make a biscut size disk. They fried up nice. But, I would like to make them paper thin like lefse. Don’t know, what flour should be used to dust the regular rolling pin & table? I may need to use a lefse rolling pin, which I have never used or made Russet Potato Lefse. But, I have enjoyed this awesome food product as a child with melted butter & sugar. 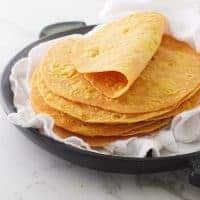 Wonder, if it would be possible to make your Sweet Potato Flatbread recipe like the old fashioned Russet Potatoe Lefse. What do you think? Lorna, I am so happy to hear you found a gluten free flour that you can substitute with good results. If you want a very thin flatbread then I think you will want to try a blend of a few different gluten free flours. Gluten free flours are particularly fussy and they tend to behave a little better when they are combined with other gluten free flours. I have rolled out some pretty thin breads with the three different flour blends that I link to in the last paragraph of this post. If those flour blends have too much starch in them for you then I would suspect that gluten free oat flour would as well. If you can tolerate oat flour then that might work. I have seen several comments on my facebook post that people are trying coconut flour. Perhaps even a combination of coconut flour and almond flour. I am particularly impressed with millet flour. Does Millet flour have too much starch for you? Thanks for an absolutely superb recipe! I’m currently living in Japan, where purple sweet potatoes are abundant, which led to me creating a visually gorgeous and mouth wateringly delicious variation! I’m interested in making these. What would be the best way to prepare the mashed potatoes without cooking them in the microwave? Hey Rick you can either bake them in the oven or boil them on the stove top. If you want to use the oven then preheat the oven to 400°F. Pierce the potatoes a few times with a knife and bake them for 45 minutes to an hour or until they are soft. When I cook them this way I don’t even peel them first because they are really easy to peel after they are cooked, the skin practically slides off. If you boil them then place them (whole) in a pot of water, bring the water to a boil then reduce the heat to a simmer and cook for about 30 minutes until they are tender. Then let them cool enough to slide the skin off. I was going to use gluten free four. What would you recommend as the measurement for the recipe? Aloha back at ya! I have used a few different gluten free flour blends and the ratio of flour was the same as for regular flour. With that said, it really will depend on the brand and type of flours that are in your flour blend. For instance, coconut flour or blends with coconut flour in it will soak up a lot more moisture. Here are some links to the flour blends that I used very successfully and used the same amount as regular flour. Hello, is pure coconut flour possible for this recipe and if yes, how much would you use? Thank you!! Would almond flour work? I am grain free and this sounds really good! Hi Yolonda, I have not tried this with almond flour but I don’t see why it wouldn’t work. The texture and flavor would be different and it would definitely be more delicate to work with. I don’t know how much almond flour you would need. If you try it I would love to hear about your results. What is the reason for the salt? Can I play with the amount? Would canned sweet potatoes mess this up? Hey Stephany, salt really enhances the flavors in this recipe. Just a small amount makes a big difference. If you have problems with salt then this recipe works well without any salt at all but it will be a bit on the bland side (but still quite delicious). You certainly could adjust the amount of salt in the recipe by reducing it or increasing it but I would not recommend increasing the salt by more than 1/8 or 1/4 teaspoon…. truly a little salt goes a long, long way and it is easy to ruin a recipe by adding too much. About using canned sweet potatoes…. that would work if you could find them canned only in water. Most canned sweet potatoes I see have been canned in sugar syrup. I saw some people comment on social media that they would like to try unsweetened canned pumpkin puree but I have not heard back to find out if their results were successful. In theory, it would work but may require a bit more flour. Looks so good, and easy! Cannot wait to try! This is really an awesome and creative recipe. Will work great with Indian and other eastern dishes. I love the sweet taste from the potatoes. 3 ingredients? :O I definitely need to try this out, I love sweet potatoes. I had no idea that sweet potatoes had more beta carotene than carrots! :O learn something new everyday! I need to have this more often! What a neat dish! I’ve made tons of flatbreads, but never even thought of using sweet potato. But I will, I will! 🙂 Thanks! Sweet potato is one of my favourite vegetables! I love that this recipe only has 3 ingredients. I need to try this one out. 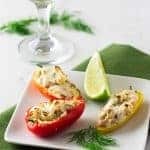 I love this recipe, I can’t wait to give it a try! They sound fantastic I make flatbreads all of the time but never considered using mashed potato as a base. I love sweet potato, this is such a great recipe! I’ve never made any type of bread with sweet potato, but you’re giving me ideas now! I make flatbreads all the time. but never tried with sweet potato, I am sure it will be tender and a great lunch item!! Can’t wait to give this a try! Love just how soft and tender they are. I love this flatbread so much! It is going into my ‘make all the time’ recipe box. Thanks for the great recipe. I love sweet potatoes! Since this recipe is easy AND healthy I’ll definitely be trying it. Thanks for sharing! Not only delicious, but so visually appealing and SO EASY! These are so great! These flatbreads look amazing and healthy! I love sweet potato! I see these in my immediate future. I bet these will be a huge hit at the lake this weekend. These look and sounds so good! So many ways you could use them! I like this flatbread with mashed sweet potato. I bet this is so yum and tasty. Love the idea of adding mashed sweet potato in flatbread dough, sounds delicious.